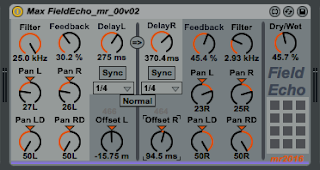 I have always liked echo, from my very early 'wannabe Space Echo' days with merely a guitar and a customised Melos 'tape cartridge' echo box, through to the wonderfully bouncy 'Ping Pong Echo' in Ableton Live. But I've also always wanted more from my echoes, and I have done lots of exploring to try and find that itchy place that needs scratching, and I have got close sometimes - look at MaxForLive.com for a host of experiments with echoes. Random time delays was one of my more recent investigations, and the lack of structure was what got me thinking about a very different approach. Turning an idea into reality sometimes clicks quickly and easily, and sometimes it just turns into treacle and everything goes slow-mo. This one didn't go well, and I spent rather longer than I ever intended getting the details correct. But I eventually got my head around it, and managed to get the Max4Live working more or less as I wanted - although as you will see, the 'Auto' function still needs some work. So what sort of echo is this latest one? 'Field Echo' is named after my intention to do something more with stereo echoes that just bounce them round from channel to channel. 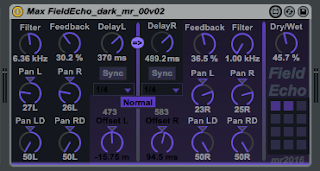 Fun though that is, real world echoes work 'inside and as part of' the sound field, and don't have ''channels, and that's why I made this new experimental echo effect. 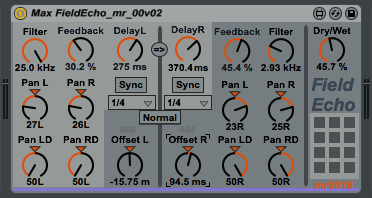 Field echo has two stereo delays in series, but the feedback is separated into 'same channel' feedback and 'other channel' feedback (ping-pong). The two feedback channels also provide two outputs per stereo delay, and these outputs can be panned anywhere in the stereo stage. The layout is exactly as you might expect, and I've mixed the left/right channel metaphor a bit, but I think it works. The best way to find out about it is to use it, so here are some hints and tips about what to explore. 1. 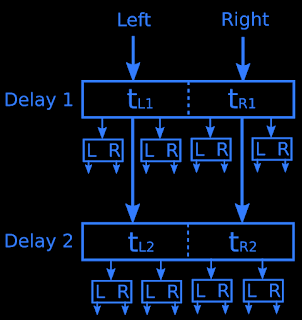 Similar but slightly different times for all the four delays is a good starting point, and panning the L and R 'same channel' outputs mid-way towards left and right, and the 'other channel' LD ping-pong outputs hard left an right. This gives a big, bold stereo echo, and a good starting point for further exploration. 2. 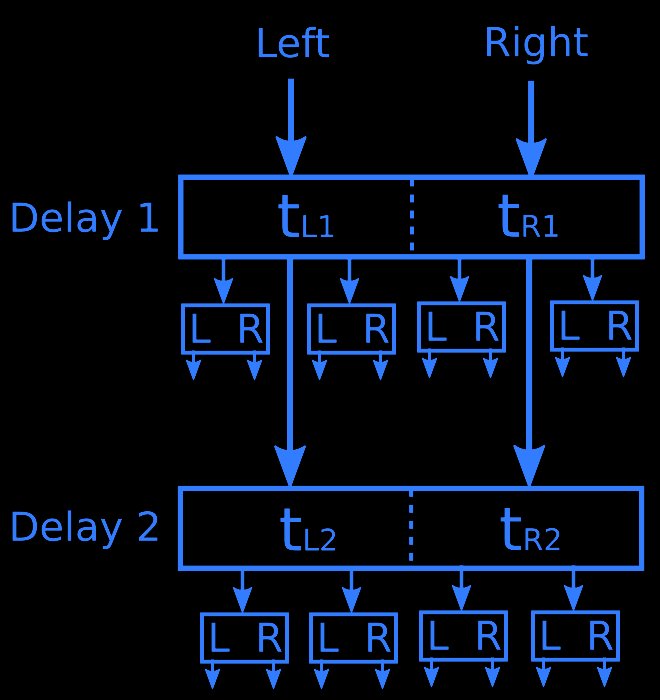 Try breaking the rules and distributing the L and R outputs to the Left, and distributing the LD and LR outputs over to the Right (Remember that the intention is to create stereo imagery, not hard left and right walls of echoes). You should find that you get interesting haloes rather than the hard brittle echoes that you might be used to. 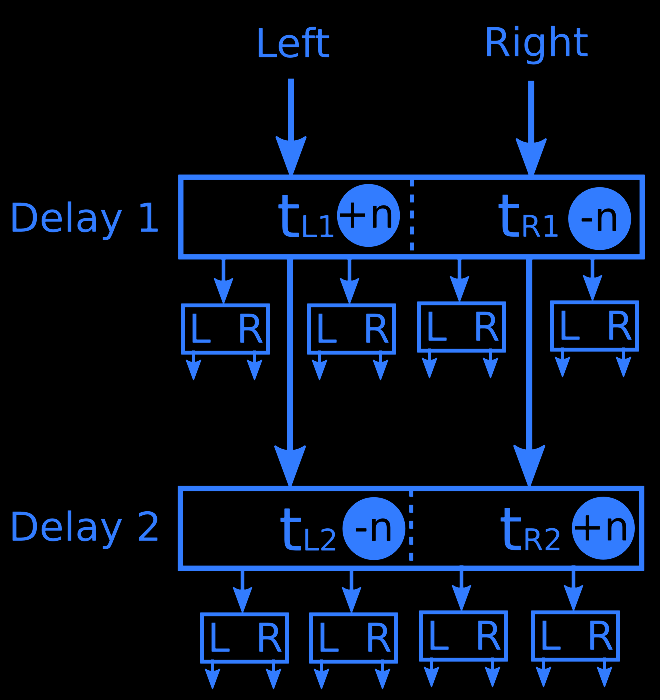 Try tweaking the delay times, and when you increase the delay in the first section, try reducing the time in the second. You should use extreme caution when using this type of setting with Marimbas or other physical percussion instruments, because you may find that hours slip by without you noticing! 3. Try the 'Auto' control for amy first attempt at making the 'up a it, down a bit to compensate' process a bit faster. I ha problems with the maths inside Max, and so this is isn't perfect, but it is still interesting, and there's now only only delay time control to play with. 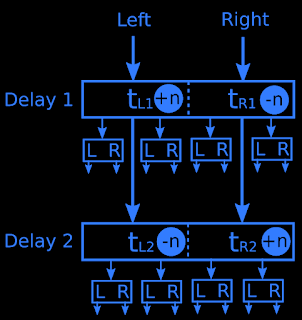 Note that you can set negative times, but the delay lines don't know what to do with them! In the next version I will window the time delays to real values. As I now do with all my M4L, there is also a 'dark' version. I hope you find Field Echo an interesting diversion for a while, and you may even find it useful. As always, you can find it on MaxForLive.com (dark) or MaxForLive.com (light).